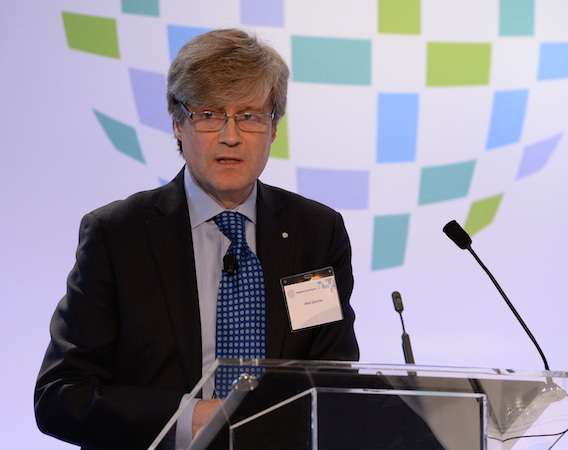 DEERFIELD, Ill. — Alex Gourlay, co-chief operating officer of Walgreens Boots Alliance Inc. (WBA), brings a unique global perspective as the incoming chairman of the National Association of Chain Drug Stores. Most of Gourlay’s career was spent at the U.K.’s largest drug store chain, Boots, and its eventual parent company Alliance Boots PLC. In 2013 he joined Walgreens as executive vice president and president of customer experience and daily living. With the formation of WBA in December 2014, Gourlay was named president of Walgreens before becoming co-COO last June. In his current role, Gourlay oversees both the Walgreens chain of more than 8,000 stores in the U.S. and Boots, which has stores in Thailand, Norway, Ireland and the Netherlands as well as the U.K. In an Q&A with Jeffrey Woldt, vice president and editorial director of Chain Drug Review, Gourlay talks about his role as the new NACDS chairman and gives his take on top issues for the chain drug sector. Here is an excerpt of their discussion. CDR: What are your priorities as you prepare to become NACDS chairman? GOURLAY: The first thing I want to say is that Steve [Anderson, president and chief executive officer of NACDS,] and his team are in great shape. One of my priorities is to make sure that I give them the support they need to do the great job they do for the membership. NACDS is a very strong association, with a very clear plan, and they take a very clear position toward what they do and how they do it. A second priority would be to recognize that the world is changing, whether it is the political world, the commercial world or our customers’ world. That includes the expectations of patients, customers and the people who work in the industry, both pharmacists and other employees. The perspective of the chairman can help the team understand what’s changing, how they can position the association and what they represent to the members for the future. Given the fact that Walgreens in the U.S. has nearly 250,000 employees and all those connections to patients and customers, it’s a role that I can play as chairman. CDR: A big part of that will be advocating for the value of the pharmacists, right? GOURLAY: Yes, in terms of what that project looks like, that’s absolutely the approach because the change affects not just the marketplace, but the patients and the people working in the industry. So advocating is a big part. CDR: Talk about how you see those areas changing. GOURLAY: Going back to my first priority, I think Martin [Otto of H-E-B], the outgoing [NACDS] chairman, has done a great job in establishing the issue of health care in America. He did that really well in all his keynote speeches, and I’ve been present for them all deliberately, so I could really understand where he was coming from. The way he’s presented that, combined with the target-setting exercise that Steve and his team have done on the back of that, have allowed their strategies to really work. It’s been excellent. Second, we have a new administration in the White House that is thinking about health care in one hand and about tax reform in the other hand. Both these things have an impact on our industry, in what could be a big way. It could be a big positive, or it could be a negative. Steve’s team is so well positioned on the Hill, and they work so well with the WBA team here as well as all the other companies represented by NACDS. We can leverage that collective knowledge to make sure we position our industry appropriately for, first of all, the conversation around the Affordable Care Act and a border tax. But we also need to have conversations about the administration’s commitments to the country and what they were elected to do in a way that is consistent with their promises, but also in a way that we think protects and grows and evolves our industry. That’s an important piece of work in supporting NACDS. CDR: Do you have specific ideas about what needs to be done, what principles need to be asserted? GOURLAY: The first concept that we need to defend is that pharmacy is a critical part of the delivery of health care in America. We need to remain the resource that we are. The number of Americans who rely on drug stores and retail pharmacies for small and big things is incredible. I read an article that was saying that Americans now trust pharmacists to give flu shots more than they trust doctors’ offices. That’s just one example we can use to remind people of where the value goes in health care delivery, and that we strongly believe that pharmacy is underutilized. It’s not just the trust factor, it’s also the value factor. The second thing is pharmacy’s changing role as the needs for health care grow. Take cancer: Many people say that in 20 years’ time, cancer will become more of a chronic condition, which is fantastic news for humanity. But as these disease states evolve over time, we would remind people that our capacity to deliver these innovations is huge. So once the new breakthrough treatments have been developed, the role of community pharmacists is significant, and it drives this idea of pharmacists being the medicine experts, doing the job that we are prepared to do and are paid to do in an evolving health care innovation market. The third thing we should be out front with is that we have to get paid for the job we do today. In any economic view of what’s happened in the last decade, pharmacies lost out. It’s our responsibility to say that we’re not looking for more money; we’re looking to be fairly paid for the value we provide in the marketplace. Therefore, expecting a pharmacy to give up more in this space is wrong, and we should call that out. CDR: You talked about pharmacy being underutilized. What sort of arguments should the industry make to secure a broader scope of practice and perhaps get some more remuneration as part of the deal? GOURLAY: When people begin suffering from a disease or illness — sometimes small, sometimes big — they could be brought into the health care system through a community pharmacist. The pharmacist could help them get the right care before they become so ill that they cost the system more money. Getting paid for that, I think, is quite simple. 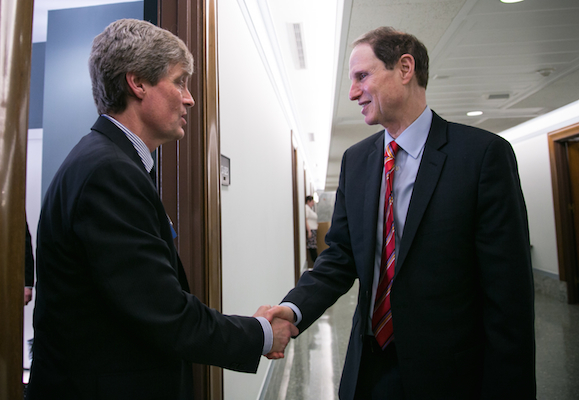 Gourlay with Sen. Ron Wyden (D., Ore.) at NACDS RxImpact Day. To gain bipartisan support, we have to demonstrate the value piece by the way it’s measured today, through a “ways and means” test. There’s an obvious support role that we can play — one that’s missing today — to get them access to the system in a meaningful way. The second way to demonstrate value is by elevating the role of the pharmacist as the medicine expert. There have been various attempts at this, through a health outcomes approach or a performance network approach. We shouldn’t give up on that. Those are just two simple examples that we should be able to get done without any extra cost to the system, in fact saving money for the system as a whole. Then there’s a third area —and it is the services we could host in a drug store. Services — not necessarily performed by a pharmacist, but performed alongside a pharmacist — that would save the health economy money. It will be a lower-cost setting and be more convenient for patients. CDR: Community pharmacists are doing immunizations for flu and other conditions pretty much everywhere. Walgreens and other chains have clinics in their stores. Do you see additional health services migrating to a retail setting? GOURLAY: From a Walgreens perspective the answer is yes. I think we should be advocating for services that pharmacists can do as part of their natural role. And we should be hosting services that others do as part of their natural role, not trying to do other people’s work. CDR: Is compliance and adherence something the industry needs to re-emphasize? GOURLAY: I believe so. Most people expect the medication the doctor prescribed will be taken properly. But not all patients take their medications 100% correctly, and we have a massive role to play there. CDR: With the debate over what to do about the Affordable Care Act taking up most of the attention in Washington is it realistic to think that other pharmacy priorities are going to get addressed? GOURLAY: It doesn’t stop us talking about these important issues. The administration has made two points. One is that they believe there is too much inefficiency in the system, and they believe in a different approach. The second thing they’ve called out is the escalating cost of drugs. Pharmacy and pharmacists can offer solutions to both these issues. CDR: Even with drug prices being pretty high, they’re still a relatively small piece of overall health care costs, around 10%. Do you think pharmacy and pharma do a good enough job reminding people just how miraculous these products are? It seems to me that a stronger case could be made for the efficacy of prescription drugs and pharmacy care. GOURLAY: I don’t agree with that. The market is very inefficient. I believe the time has come to work together to drive efficiency through the supply chain. The cost of these medications is often much more than they cost in other countries. Second, the waste in the system at all levels is quite significant. If you were to speak to insurance companies in this country, they’ll tell you that prescription drugs are the fastest-growing part of health care spending. Spending on drugs increased 9% in 2015, while overall health care costs increased 5.8%. CDR: Let me ask you about your first point. Aren’t prices lower in other countries because the government dictates what goes on in the pharmaceutical market? GOURLAY: In the U.S., from the data I’ve seen, a lot of drugs come to market doing more or less the same thing at the same time. What happens in Europe is that only the best are allowed to go through. For sure, the U.K. system is too constrained. But on the other hand, the American system is far too expensive. CDR: Many patients are also struggling with costs. GOURLAY: I’ve read that 51% of Americans with insurance have co-pays of $2,000-plus for medication. So pharmacy is becoming more like dentistry, where you’re not sure how much you can afford because the costs are high and you’re only getting half of the cost that is covered by your insurance company. We can do something about that if we choose to. CDR: Where does community pharmacy fit in? GOURLAY: We’re at the end of the stream, so we have to tell patients that their medication used to be $10 and now it’s $100. We’re also in the stream when there is pressure to reduce costs. We’re at the end of both streams. We’re getting squeezed here, and we’re dealing with the patient who’s been squeezed. The system that drives the price down needs to be reorganized end to end, and that’s why Walgreens Boots Alliance has been trying various models to get that sorted out. CDR: How does your experience in the United Kingdom influence your approach to the U.S. market? GOURLAY: It does give me a different view, which offers me an opportunity to give the team at NACDS advice on options for it to be different in this space. The U.K. market has its problems as much as the American market has its problems. I can offer a different perspective, and then it’s up to the NACDS board of directors and the management team to agree if that’s the right perspective or not. CDR: How is the front end of the store evolving? In this phase, there is what feels like the start of a recovery of the consumer market in the U.S. People are feeling a little bit better off. But it’s countered by what I would call deflationary pressure, which is really coming from commodity pricing. What the drug store channel needs to look at is where the customer is going to in this phase, how she will use a pharmacy-centric business, and what should be surrounding it beyond the obvious products. Every pharmacy operator is considering that in different ways. It’s a tough phase for the front end. CDR: You still believe in the front end. GOURLAY: We believe in the customer more than anything else. We believe in wrapping around the pharmacy the products and services, including omnichannel, which customers want to buy and presenting it as more of a health and beauty specialist. There are more convenience options available today, which is causing a channel shift, and people’s expectations of what they get from a health and beauty specialist is determined to a large extent by how they do research and what’s online. So I think it’s a very different phase for drug stores coming up. CDR: When you say there is a channel shift away from drug stores, is that in terms of food and other convenience products? GOURLAY: Yes. It’s been happening for a while. It’s not a new phase, it’s just an accelerated phase. CDR: You also noted that customer expectations are changing. If you take skin care, for example, as a key bridge between health and beauty, it starts with some serious diseases and goes all the way through things that aren’t harmful but that are very disruptive, and everything in between. So we see that bridge as just one example of what customers are looking for. Who do they trust to say this is the product that’s right for them? They appreciate a chance to see inside the brand. We started this conversation with our CSR [corporate social responsibility] report. Customers trust companies that are very transparent, that are very open about what they do, why they do it and how things are done. One of the things I want to do with NACDS in an appropriate way is instill the philosophy of CSR, because all of our members are doing the right thing and building on the trust they have earned. That’s really what CSR is about. The final thing I would say on trust is that it is what has carried pharmacy for centuries and will carry it for centuries into the future. It is the reason why pharmacy will always have a physical presence in the community. *Editor’s Note: To read the full interview with Alex Gourlay, please see the April 24, 2017, print issue of Chain Drug Review.